As some of you know, I am all about reinventing the second half of life. If you follow me on Instagram, it’s about style, beauty, health, and happiness. 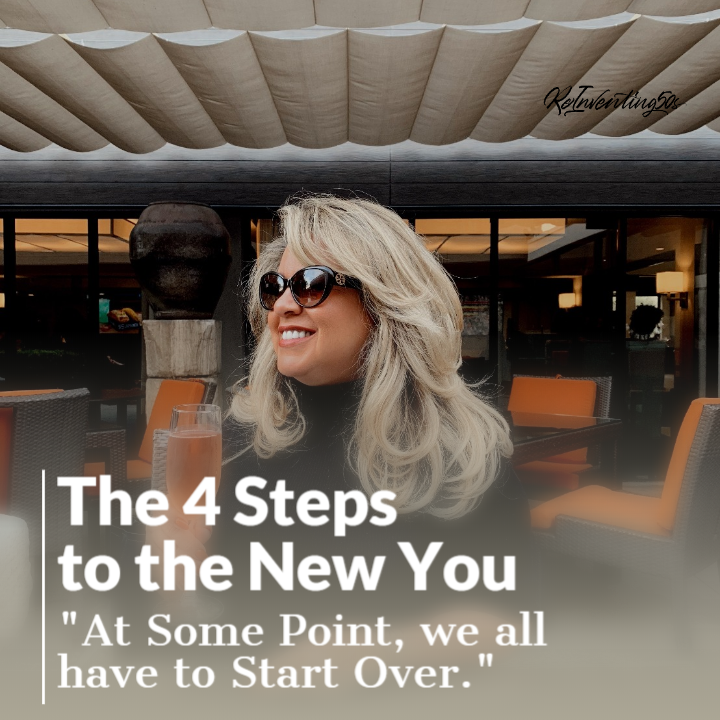 Today we are going to break down the four basic steps to reinvention. So why reinvention of self? There are many reasons. Are you still working? Single? Married? Raising kids – we never really stop doing that. Are you one of the lucky ones who is retired and living life with your grandkids and traveling as much as you can? Or perhaps, you are still fighting the good fight in the marketplace. Whatever stage you are in, you can always move in a different direction. If you are lucky enough to live long enough, at some point you will reinvent some aspect of your life. So… What does it mean to Reinvent Yourself? Well, in a nutshell, it means you have to start looking at yourself in a different light. You’re lucky, you’ve lived this long and you have made mistakes but what do we tell our kids: Learn from your mistakes. You have to take responsibility for your mistakes. Own them. Nobody is perfect and aside from murder, everybody is going to understand. There is something very freeing about accepting responsibility for what has happened in your life; the good and the not so great. It gives you a starting point, which takes us to step 2. Now it comes time to grab a pen and paper and start asking yourself why do you want to start over? Are you forced to by an outside situation, like job loss? Health issues? Are you at a time in your life where you need to pivot and move in a new direction? That’s important to know. It’s part of the process of accountability and it will make sense to you as to the “why” once you start down this road to the new you. Also, what are your passions? What do you SEE for yourself in the future? Notice I didn’t say what do you want to do in the future. It’s too broad. Be specific. What motivates you to change? What are your skills? Do you like to cook? Lastly, but most importantly, are these answers in line with your moral compass? They should be or you will fail. Keep your list of reasons as to why down to five. Everybody can count to five and that is just enough to let you feel accomplished without being overwhelmed. Engage with yourself! Start working on your vision. This can take many shapes, physical mood boards, Post-It notes, pictures, magazine clippings. And digital ones too, like Pinterest. Don’t forget journaling is a wonderful way to map out the new you. But be specific in your vision as to what you wrote on your previous list about passions. Work and rework this stage of the process and enjoy the many opportunities you will discover about yourself. Like you didn’t know you like chess so much!! Or that starting a business is really your thing! What’s your actual Call to Action! What are you going to do tomorrow, next week, and next month? Yep, write down the EXACT things you are going to do. “I will get up at 6:00 am, get my coffee, and put on my shoes to walk around the neighborhood. I will check it off my list when I get back.” You can’t cheat yourself. You know whether you did it or not. One important thing to remember, reinvention is a long-term process. You will stumble. You will trip yourself up, but that’s the process. And you deserve to be who you want to be. So, what do you want to accomplish in 2018? Participate in your future and what challenges you are facing and how you are going to pivot and #ReinventIt!! Follow me on Facebook and Instagram @Reinventing50.